Our first game, Frontline General: Italian Campaign Introduction, is a campaign system that drives tactical miniatures battles. Battles are generated from an operational level map and they may be resolved there or on a miniatures table for more detail. We made a few force size abstractions to help make this flow smoothly, but it works, and players of the original game still enjoy the game today. 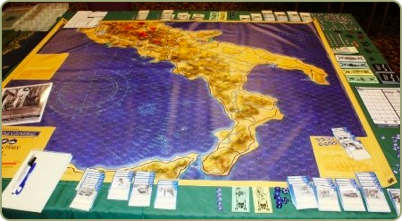 Mark Mahaffey originally created a full-size map of Southern Italy (you may have seen it at a convention) but we only released a portion of that map with the game back in 2008. The MSRP would have sky-rocketed at the inclusion of a 60"x50" map in a low quantity print run and it was just too risky at the time. This map is about the size of four typical 34"x22" wargame maps put together. Recently, we tried to figure out a way to release this very beautiful Mark Mahaffey map and considered printing it in a low quantity print run, using print-on-demand services, or releasing it as a Print-And-Play product. We feel the best way to offer it to you is through Wargame Vault, who specialize in providing print-and-play wargaming products from many different publishers. We will soon be listing the map's full resolution PDF on Wargame Vault for download at a very reasonable price. Interested players of ICI may then download the map file and have it printed at any large-format printer near them (or at work- gasp.). This is ultimately the cheapest option for you, the player, because it eliminates shipping if you have it printed locally, helps support us and the folks at Wargame Vault, and best of all, expands your Italian Campaign Introduction play area to a massive 60"x50" map area (20.8 square feet.) encompassing all of southern Italy. We certainly hope you'll embrace this idea and consider purchasing the map once it is uploaded to WGV (a future update will let you know as soon as it is online). Please let us know what you think.